✓ A taste of Games for all athletes! ✓ In 3 Fitness Levels/Categories (Beginner – Intermediate – Rx)! This Year Also a TEAM Category! 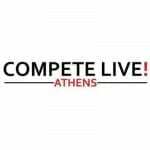 Because competing live… is a Game changer!